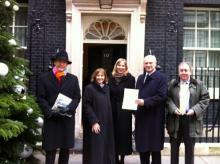 The Heart of the South West (HotSW) LEP has visited Westminster to lobby for Transition Funding. HotSW delivered the plea to Downing Street and held a series of briefings with MPs, to build support for jobs and growth in Devon, Plymouth and Torbay. A Transition Zone classification would mean a share in £2.6 billion of EU funding. The funds would be targetted at the most important local priorities, which could have huge economic and growth potential. The visit was arranged as part of the LEP commitment to a fairer share of EU funds. Whilst Transition funding would only apply to Devon and Torbay, it would also would provide an overall uplift in the economy of the Heart of the South West LEP area. It would enable funding to be more targeted, lever additional value through some policy flexibility on areas such as infrastructure and ensure that there was more money as a whole within the region, thus benefiting the whole area. We recognise that Cornwall must continue to qualify for highest level funding, but the success of the wider Peninsula economy requires a sensible, joined up approach to economic growth and that must include structural funding.